Scene setting: Hundreds of dangling light bulbs hung from the ceiling of Hammerstein Ballroom, evoking the feel of a twinkly night sky. As the models marched out, the pounding beats of club music played, most notably Underworld’s Born Slippy. Mood board: Word was that the actual mood board contained images of 1970s hippies, Woodstock and Fiorucci. On the runway, it felt more like a 1990s rave vibe, with tall platform boots, dreadlocks in My Little Pony shades, licorice all-sorts appliqués and camouflage. 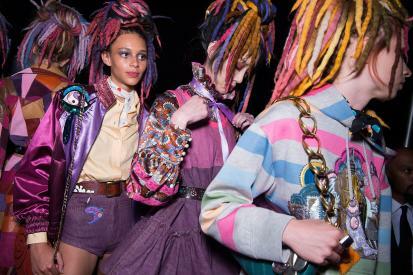 Best in show: Marc Jacobs tapped British artist Julie Verhoeven to create the colourful, wild, acid-trip-like imagery – which injected even more energy into the lively collection – on the clothing and accessories. While the vivid brocade and sequined jackets weren’t so wearable for everyday use, they provided a whimsical element of fantasy.